It's winter in the Catskills and Mitchell's Inn, nestled deep in the woods, is the perfect setting for a relaxing--maybe even romantic--weekend away. It boasts spacious old rooms with huge woodburning fireplaces, a well-stocked wine cellar, and opportunities for cross-country skiing, snowshoeing, or just curling up with a good murder mystery. So when the weather takes a turn for the worse, and a blizzard cuts off the electricity--and all contact with the outside world--the guests settle in and try to make the best of it. Soon, though, one of the guests turns up dead--it looks like an accident. But when a second guest dies, they start to panic. 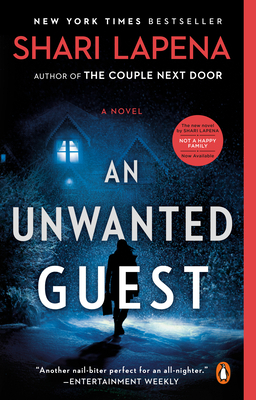 Within the snowed-in paradise, something--or someone--is picking off the guests one by one. And there's nothing they can do but hunker down and hope they can survive the storm--and one another. Shari Lapena is the internationally bestselling author of the thrillers The Couple Next Door, A Stranger in the House and An Unwanted Guest, which have all been both New York Times and UK Sunday Times bestsellers. Her books have been sold in 35 territories around the world. She lives in Toronto. "Great suspense and lots of twists." "Lapena keeps the well-developed twists churning, with each a surprise notch in this ever-evolving plot, and she continues this skillful storytelling until the stunning twist at the end. . . memorable."